The two Koreas’ senior military officers are to hold a meeting Friday at the border village inside the Demilitarized Zone, the Defense Ministry said Monday, in an effort to assess the implementation of the comprehensive military agreement signed last month. According to the Ministry of National Defense, the two Koreas’ militaries agreed to hold general-level talks at the truce village of Panmunjom. The meeting will kick off at 10 a.m. in the North Korean building Panmungak. 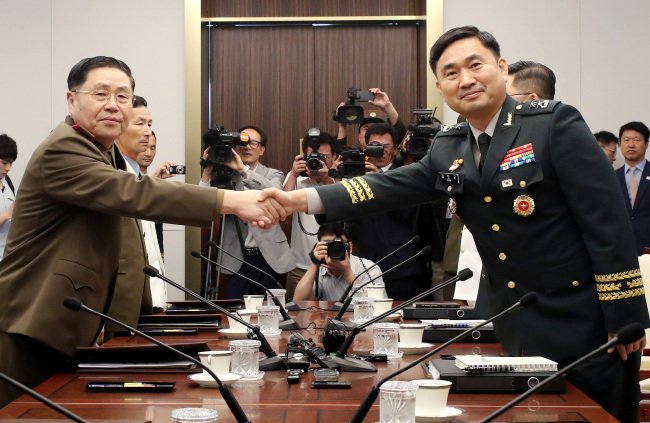 During the meeting, the two militaries are expected to discuss how much progress has been made since the inter-Korean military agreement was concluded. The pact involves the suspension of military drills along the DMZ and the establishment of a no-fly zone around the border area. Among the items on the agenda is when and how to launch a joint military committee between the two Koreas. The two sides agreed to establish the committee as part of the military agreement signed at the inter-Korean summit in Pyongyang last month. The joint committee was proposed after the two Koreas signed a comprehensive nonaggression agreement in 1992, but never materialized due to turbulent inter-Korean relations. If the two Koreas’ militaries manage to agree on a launch schedule, the joint committee will serve as a permanent body for the two Koreas to build more trust on military issues, defense officials said. Maj. Gen Kim Do-gyun and his North Korean counterpart Ahn Ik-san will lead Friday’s general-level meeting. The two generals, who have attended previous general-level military talks, will lead a five-member delegation from each side.